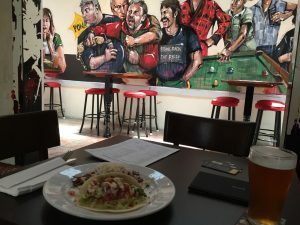 The Wayward brewery is a relatively new arrival in our neck of the woods. It is hidden away, down a side street in a light industrial part of Camperdown, so it could have been here for a while. It is one of those places that you have to know about to know about. Strop and I ventured across Pyrmont Bridge Road to check it out on a cold winters night. It wasn’t our first visit to Wayward, that had been the week before, when we braved the tail end of an East Coast low to have a drink at our new local with Paul, Ashley, Ned and Mark. It was very jolly inside, with live music, a convivial crowd and quite a lot of beers were drunk. Especially by Strop. 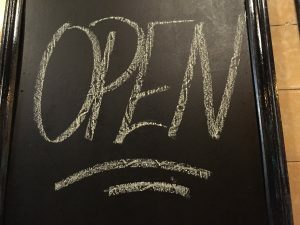 Wayward is open four nights a week as a bar, but I assume that the brewery part is going full-time. The arrival experience a takes you down a broad ramp into a cavernous space with a bar on one side, a brewery round the corner, and a couple of smaller rooms at the back, that look a bit like Hitler’s Bunker if he had been around in the 1970s, or maybe somewhere in Falujah. Reassuringly, the bar staff are all heavily tattooed and bearded, so at least we know we’re still in the inner west. 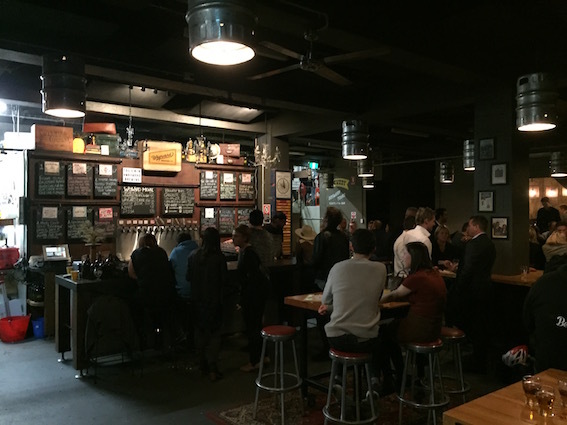 They have a few wines for sale, but the main deal at Wayward is definitely beer. 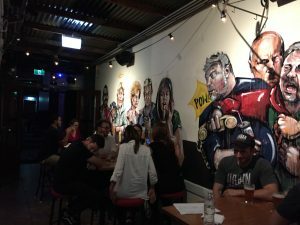 There is a row of numbered beer taps along the wall behind the bar, and above them a beer menu. There are a lot on offer, and the descriptions are pretty fruity. But in a good way – lots of pineapple, raspberry and passionfruit mentions. The night Strop and I went on our own, the place was packed, mainly with thirty-something men. It turned out that the brewery was running tours, and most of the punters had turned up to be shown around and to try the range no doubt. Strop and I found a free table at the back, in one of the concrete bunkers. These things are so secure that no phone signals can get through, which might explain why there were some spare tables in there. The bunkers are furnished somewhat eccentrically, and feature a wide range of furniture. The chairs were very comfortable in a way that only the 1970s managed, although at the cost of aesthetics. My first choice beer, the Camperdown (nominative determinism rule), wasn’t available, so Strop bought me an Otis, presumably named after the lifts. She chose the appropriately named Charmer for herself, which was strong and chocolatey. My Otis on the other hand had distinct passionfruit tones, which was pleasantly weird. In the laneway outside Wayward there was a tent set up, and a sign promising Italian food. We went the whole hog and ordered ragu in focaccia, arancini, and polenta chips. It was all good but the ragu was a standout, especially on a cold and rainy night. Very warming. El yummo. You can also get pizza ordered in from one from of the local pizza joints. Unfortunately, it isn’t one of the local pizza joints that we favour with our custom, but I will be more than happy if the guy in the tent keeps serving up the ragu. Another new arrival in our area is Camperdown Commons. This is what has become of the old Camperdown Bowling Club. Nowadays it is a restaurant slash urban farm. I think I would have rather kept the bowlo but it had an unfortunate habit of going broke, and, frankly, serving crap food. The two facts may be related. The new venture has high ideals, grows its own kale, has a chook yard, even serves Wayward ales, but we are yet to see if it walks the walk. There is a fair amount of style over substance going on. 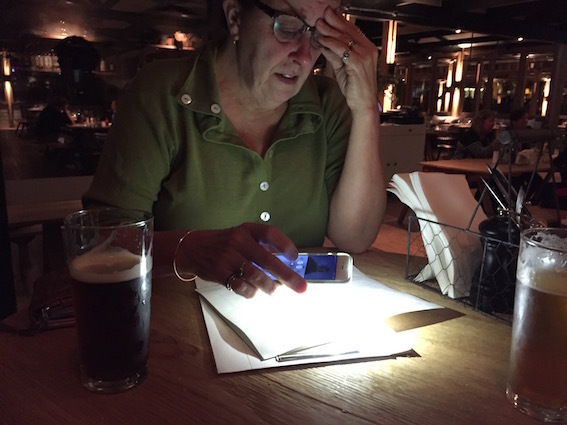 It is cleverly styled with lighting so subtle that Strop had to pull out the torch on her phone to read the menu. The furniture is very nice, slightly rustic, and wooden, and there are big tubs of firewood lying around as well. I kept looking but I couldn’t find a fireplace anywhere. Maybe they’re going to do wood-fired pizza. 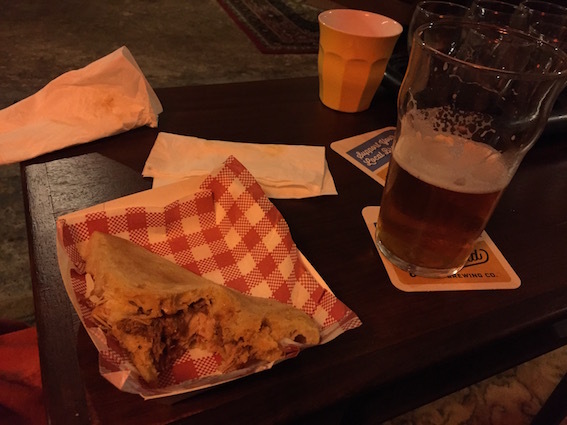 During the schmoozing-of-the-neighbours stage of development, there was a lot of talk about this being a local joint for local people. A quick glance at the price list suggests that it is the sort of local you are probably going to save for the odd special occasion. Strop and I dropped in for a quick meal on its first weekend. The bar food was okay, but nothing to write home about. Camperdown Commons (surely a name devised by a committee) promotes its locally-sourced everything, and ethical proteins etc, but there are nowhere near enough tattoos for my liking. Given it’s size, it is going to have to drag a lot of punters through the door. We shall see. I hope it is a success, especially after all the work they have done on the site. But unless they review the prices I will keep heading across Pyrmont Bridge Road for my Wayward beers and the ragu from the tent. Pastizzi. They make a mess sure, dropping crumbs everywhere, but they’re crunchy, tasty and obviously really good for you. Basically, they’re just Italian sausage rolls. With more flavours maybe. 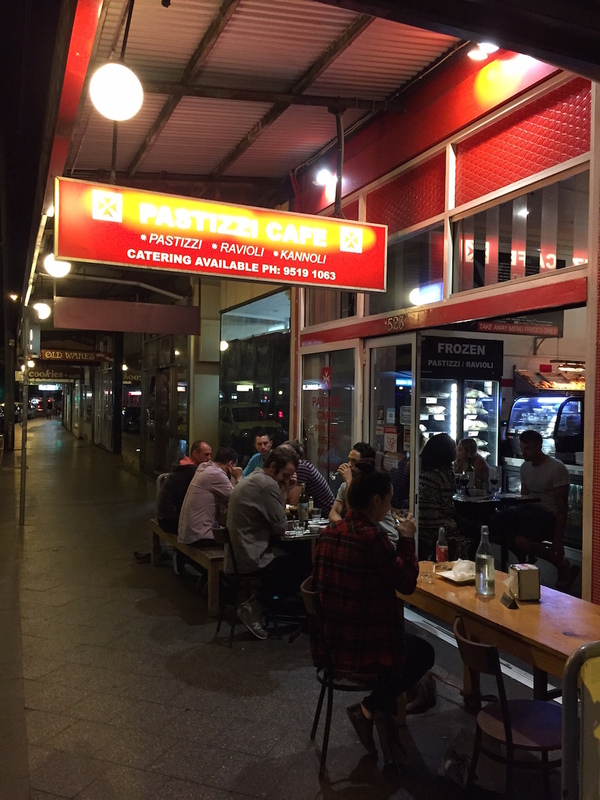 Pastizzi Café, as its name implies, has made a speciality of them, and does a hectic take-out trade, selling a wide variety, including sweet ones as well as savoury. 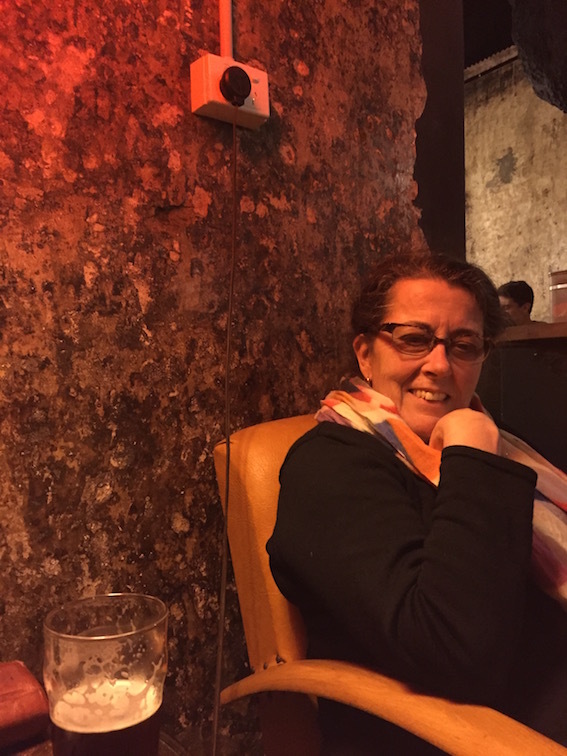 But the café is also a restaurant, a very busy one, as I found out when I arrived at 7pm on a Friday night. As I approached, I thought I was in luck. There were two empty tables out the front, but as I got closer it became apparent that the empty tables were occupied by nasty little Reserved signs. Inside the café, all the tables along the side of the narrow room were full. When I asked one of the busy looking waitresses if they had any tables, she said “Sure,” and disappeared so quickly towards the back of the restaurant that I nearly had to run after her. She went out a door at the back, and by the time I got there, I was just in time to catch a glimpse of her disappearing again at the other end of a very narrow passageway. It was so tight that my shoulder accidentally bumped the fence, which was immediately followed by a crash and some muttered swearing. It seems I had upset the neighbours, or at least something that had been balancing on the fence. When I finally caught up with the waitress she was standing beside an empty table in a makeshift dining area that had been created by putting a roof over the backyard. There were a couple of other occupied tables, and at least it was close to the toilets. When this Speedy Gonzales of waitressing had set me up with a menu, cutlery, and napkins, she put some music on and disappeared again. The music was a disco version of Sweet Child of Mine, which she must have like because she had it turned up really loud. When Strop arrived we could hardly hear each other until a second waitress, this one with tattooed legs, turned it down again. The menu Pastizzi Café is fairly simple and very Italian as you would expect. Lots of fresh pasta options, some fish, chicken and beef. There were some specials too but we decided to stick with the basics. There is home made ravioli and, of course, pastizzi. Strop had the bright idea of topping and tailing the meal with pastizzi. So we ordered a couple of salmon, dill and ricotta pastizzi to start, figuring we’d have a couple of sweet ones for dessert. 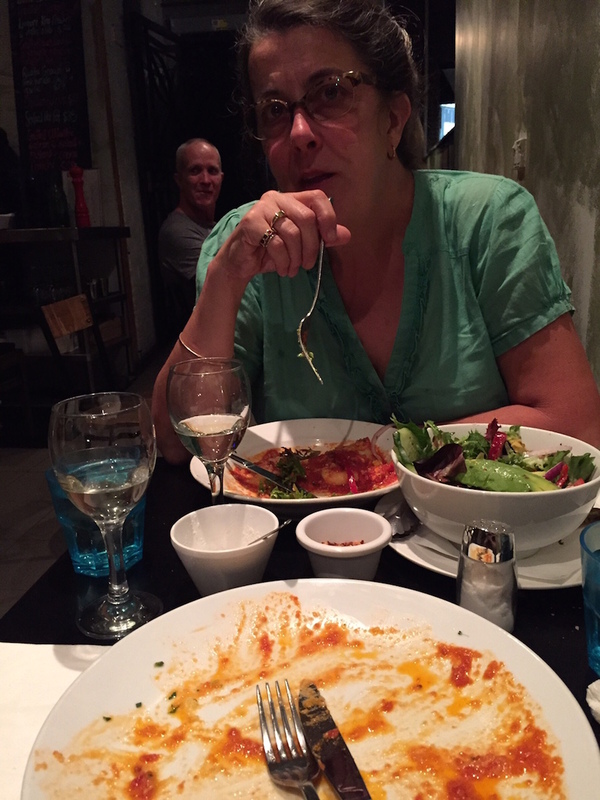 In between times, she ordered ravioli and a small salad, while I opted for chicken parmigiana. Having decided on the food Strop headed for the nearest bottlo for some wine and I looked at my phone. 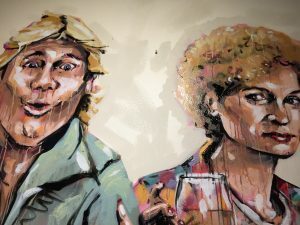 When she came back with a very welcome bottle of Pikes Clare Valley Riesling, she wrinkled her nose and muttered “I can smell dope.” Now this is a bit of a thing with Strop. She reckons she can smell people smoking dope nearly everywhere she goes, and especially in Newtown. There must be a lot of it about, either that or she has a very finely attuned set of nostrils because I can never smell it. These days I need to be actually handed a joint before I can smell it. 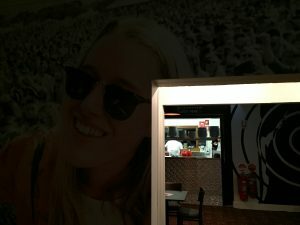 When the waitress started pulling a strange face and mouthing something, which, after we gave her a series of bemused looks, turned out to be “Can you smell weed?” She had to whisper it because there were a couple of impressionable children at the next table. Strop was delighted to have her nostril’s accuracy confirmed, “Yes!” she exclaimed, “I think your neighbour is smoking dope.” It was at this point that it occurred to me that the thing I had knocked off the fence earlier, may have been their bong. It would account for the swearing. Our salmon pastizzi were hot and crunch and tasty. They didn’t last long and were soon followed by the mains. Strop had opted for the entrée size spinach and ricotta ravioli, which was a smart move because the serves are generous. Her small salad was enormous, and my chicken was so big that there was only a bit of room at the edge of the plate for a splodge of mashed potato and a few vegetables. The ‘parmi’ was the best I have had in a long time. There was plenty of eggplant, the chicken was tender and moist, and the tomato sauce fresh, tasty, and abundant. Yum. The ravioli was good too, with a similarly tasty sauce. Strop wasn’t able to finish the salad, so we decided to take it home, together with a couple of dessert type pastizzi – to have at home, or for breakfast in the morning. Either or.